For most people the words Christmas tree have happy connotations. For a few, their sentiments are probably rather different. Because a Christmas Tree can mark the difference between success and failure. A dividing line that is measured in fractions. Very small fractions. Thousandths of a second. The Christmas Tree we’re talking about is to be found standing on concrete. On the start line of a drag strip. In a race that can last as little as four seconds or less, thousandths count. Anticipation is everything. Reaction time key. And it begins, and sometimes ends, with the Christmas Tree. Let’s explain. The art of start is everything in drag racing. It’s a carefully choreographed dance to the line in preparation for a perfectly timed launch. It starts with staging. At the very top of the Christmas Tree are two amber lights, one for each lane, labelled pre stage which are triggered by a beam across the track. The drivers approach the beam with care, because just seven inches down the track is another. To help hit the beam as accurately as possible there’s normally a pit crew member indicating to the driver how far they need to roll to break the pre stage beam. That’s the easy bit. Next challenge is triggering the stage light. And that needs a delicate touch to coax what might be a 10,000 horsepower monster just seven inches down the track with you sitting 30 feet behind the front axle. For that you really do need a pit crew member to guide you into the sweet spot. And this is where the gamesmanship starts. The mind games begin. Because once both cars have broken the beam and lit the second amber ‘stage’ light on the tree, the final starting sequence is triggered. There’s no turning back. The train is going to leave the station with or without you. That’s why some drivers like to be the last to break the beam so the sequence has flow, with no interruptions. While others prefer to stage early, so they can fix their concentration solely on the lights with nothing else to distract them. The result can sometimes be an “after you” “no after you” game played out in front of the start line. But with the pre stage and stage lights glowing yellow, the final start phase of the start sequence is triggered. 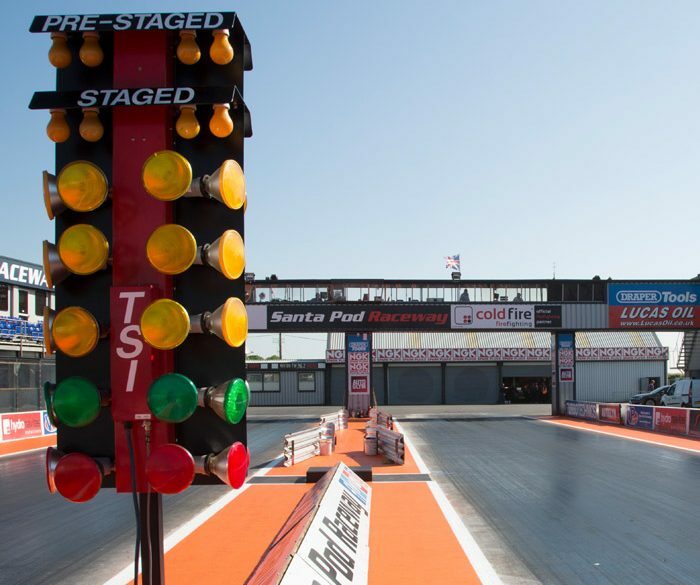 With a pro start the the next three amber lights illuminate simultaneously and then the green and this is when the race can be lost or won. Basically the time ‘delay’ between the amber light coming on is .400 of a second and the same again before the green comes on. Wait for the green to light before letting the clutch drop will almost certainly lose you the race. What the driver who has mastered the art of start does, is go as the three ambers illuminate initially knowing that the combination of his or her reactions and the mechanical delay in launching the car will take at least half a second or more. That means inertia is translated into momentum a fraction before the green lights up. Hey presto the perfect start. Easy huh? Well it might be if there weren’t a few other factors coming into play that need to be allowed for, because when you’re dealing in margins of thousandths of a second every bit counts. First is reaction time and the time of day. As the light level falls so does the sensitivity of the eye, therefore your ability to spot that subtlest change in colour will diminish or get slower. Also as the temperature cools your engine tends to develop more power and so be more responsive off the line. It’s stuff like that teams are constantly trying to allow for and in part can adjust to optimise the cars performance off the line. But the reality it’s the driver who’s in the hot seat and they have the power to make or break the run. Did we say break? P.S. Sharp eyed drag racing fans will spot the deliberate mistake in the Christmas Tree picture above. If you can’t maybe you shouldn’t be racing.